Rebecca Neale of Bedford went to her library in advance of a family vacation to borrow a child safety harness for airplane travel — something she may need only once or twice a year, but doesn’t want to fly without. One concern, conceded Chadwick, is liability, which can be an issue with tools, mechanical items, or even cake pans should any food allergens be transferred. Accordingly, even though usage is free, borrowers sign contracts acknowledging their responsibilities. Sara Levine, assistant supervisor of public services for the Newton Free Library, watched in delight as her library’s small collection of ukuleles almost hopped off the shelves. “First we bought eight. They were so popular we bought four more. But we still have a wait list,” she said. Three years ago, children’s librarian Amanda Meyer used grant money to create thematic backpacks focusing on a theme such as birdwatching or astronomy. Then she added outdoor games to the collection, as well as a play parachute and some snap circuits for electricity projects. “It’s something we think of as part of our service to our community. And it’s a lot of fun,” Meyer said. 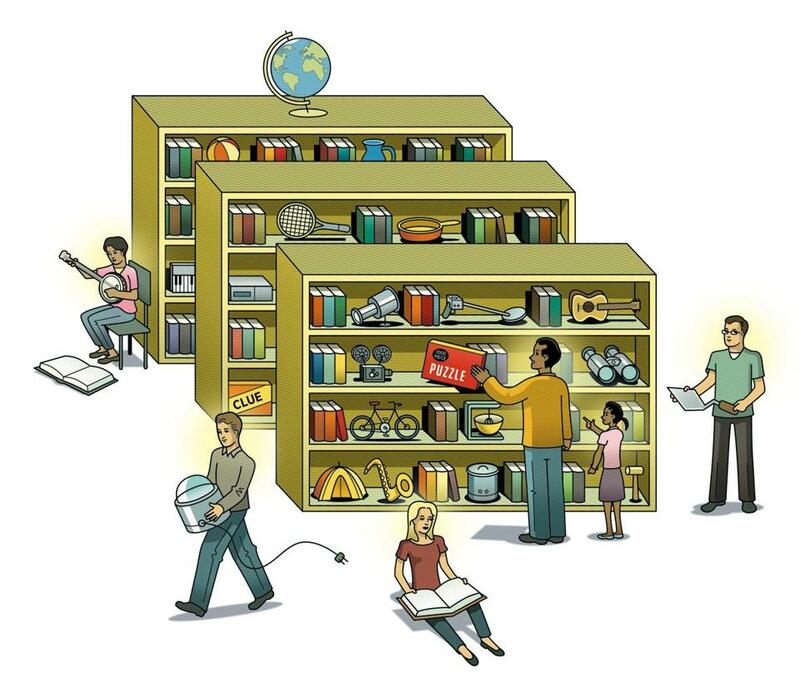 Purchase of most items is typically funded from the library’s regular budget or occasional special grants; other items are donated by patrons. But there’s also limited-use technology like a machine that converts VHS tapes into DVDs. “Once you’ve done that, you don’t really have further need for the equipment,” O’Gara said. This last point resonates particularly with Laura Moore, a downsizing and personal organizing expert whose Concord company is called ClutterClarity. “Initially, our collection was mostly board games,” said Kimberly Blakely of Wilmington’s public library. “Then someone offered us a telescope. Jigsaw puzzles are great for Libraries of Things because once you’ve put together a puzzle, you don’t necessarily want to do the same one again. Still, as the Boston Public Library’s recent initiative has affirmed, sometimes what you need is not a laminator or a ukulele but Wi-Fi access, and many suburban libraries lend out hotspots as well. It was a lifesaver for Jennifer Campbell of Boxborough last winter when a snowstorm necessitated driving rather than flying to Myrtle Beach for vacation. 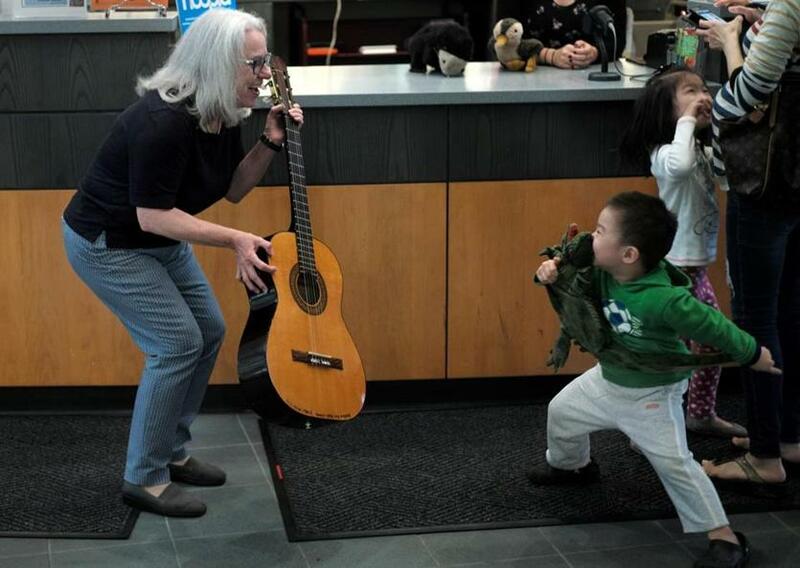 Noreen O'Gara, assistant library director at the Bedford Free Public Library, showed a guitar to a little boy who was about to check out with some items from a display. Nancy Shohet West can br reached at nancywest@gmail.com.